Having problems understanding equivalent “EQ” metal framing and how it compares with traditional metal framing? Are you receiving the correct, properly tested material on your projects? 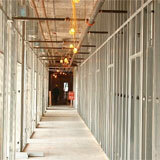 Since their introduction much has been done to develop standardized requirements for “EQ” metal framing products. This presentation will address these questions as well as outline the ASTM standards that govern the specification and performance requirements of both traditional thickness and EQ products and how they meet the requirements of ASTM C645. The course will also show how the studs contribute to LEED credits. It will conclude with an analysis of how “EQ” studs are listed in fire-rated assemblies.